With your spring cleaning efforts currently in full swing, it’s worth taking a little time to consider your home air quality. Most of us take it for granted that our indoor air quality is fine. Scientific research, however, has found it to be an area we should be paying a lot more attention to. Studies by the Environmental Protection Agency and other environmental health organizations show that the quality of most indoor air is actually worse than the air outdoors. Air pollution levels in indoor spaces are typically 2-5 times higher than pollution levels outside. So how can that be? What causes poor home air quality? A big contributor to poor air quality in homes and other indoor spaces is, quite simply, that not enough time is spent cleaning them, especially when it comes to vacuuming and dusting. The products we buy and the chemicals they contain are another major reason our home air quality suffers. Unless you’re ultra-vigilant about what’s being brought into your home and used there, it can be difficult to maintain a healthy level of indoor air quality. Indoor airborne pollutants also come from things like cooking residue, pollen, mould, and pet dander. The fact that we inhabit tightly sealed environments that don’t get much air flow exchange with the outdoors doesn’t help matters, either. Because the average person spends about 80-90% of their time indoors, it’s important to do what you can in your living space to improve its air quality. The spring time is typically when a home is most in need of a refresh. Those long Canadian winters keep us indoors a lot more and don’t give homeowners many opportunities to open some windows. That keeps stale air, allergens, and other pollutants trapped inside. Of course, leaving screen doors and windows open can also bring in outdoor pollutants, particularly in high traffic areas, downtown areas, and during hot weather. It’s a tricky balance, to be sure. Here are some tips to help you improve your home air quality by reducing the number of pollutants in your living space. Finding the time to clean your home as much as it really needs it is always a challenge. But as you would expect, regular cleaning is one of the single-most impactful ways to reduce the number of toxins indoors. It’s generally recommended that regularly used areas of your home should be vacuumed a minimum of once per week. Higher traffic areas should get a little more attention, perhaps two or three weekly vacuumings. Carpeted areas in your home will also need more vacuum maintenance than hard floor surfaces. Cleaning properly is another key to make your cleaning efforts more effective. Avoid using dusters, for starters. They don’t actually remove dust, they merely disperse dust from one surface to another. Wipe shelves and other surfaces with a damp soft cloth or microfibre cloth. Thorough cleaning is also important. You can’t realistically get to every single nook and cranny in your home every time you vacuum, dust, and mop. It is important, however, to occasionally attend to those areas of your home that aren’t the main floor surfaces, such as curtains, ceiling fans, baseboards, walls, and behind large appliances. To eliminate the headache of vacuuming underneath beds and sucking up all those elusive dust bunnies, consider getting a bed surround. They replace all of that wasted empty space underneath beds with useful drawer storage and incorporate additional storage space around the bed. Let’s expand upon that “clean your home regularly” point and specifically address home clutter. You might not see a direct connection between excess clutter and poor home air quality, but it’s there. To illustrate how clutter affects the air quality in your home, picture several stacks of boxes in the corner of a spare room that haven’t been touched in months. Those stacks (and floor clutter in general) make it harder to vacuum the room, which gives you an excuse to not to do it. Extra clutter also impedes the airflow in a room and gives dust more surface areas to rest on and accumulate. Take advantage of the wealth of effective storage and organization products available to keep your home tidy with less effort. The most popular laundry and cleaning products boast about how fresh they’ll make your clothes smell and how immaculate and spotless they’ll leave the surfaces in your home. The irony is that while these products may be effective at cleaning and eliminating germs and bacteria, most of them also add pollutants to your home’s air when used. Even getting your dry cleaning done can bring pollutants into your home (from the chemicals used in the cleaning process). It can take a big effort to make major changes to what you buy and to check on the environmental impact of every product you purchase. But controlling the source of indoor pollutants will help to improve your home air quality. Adding a standalone air purifier (or two) to the areas of your home that are most frequently used is another solution for improving your home air quality. Bedrooms, the kitchen, and the living room are ideal locations. If you don’t want to deal with moving a standalone air purifier from room to room, whole-house air cleaning systems are available which are integrated into your HVAC system. Air purifiers remove contaminants from the air and can help improve the comfort level of those with allergy and asthma issues. Air purifiers are also recommended for homes with smokers. Ionic and HEPA air purifiers are the two most popular types of standalone unit choices. Do your homework before buying, as features (such as whether the unit can remove odours, square footage covered, and operating volume levels) vary widely from model to model. Dirty air filters that trap pollutants and allergens recirculate poor quality air indoors, so they need to be maintained to keep your home’s air quality healthy. Timely air filter replacement on HVAC systems, range hoods, kitchen and bathroom air vents, and vacuums tends to get overlooked. Staying on top of this task is a cost-effective way to maintain healthy home air quality. Energy Star recommends changing your HVAC filters monthly during the winter and summer seasons, when your furnace and air conditioner are being used most. Change them every three months at the very minimum, regardless of the time of year. Unclogged air filters improve the efficiency of your home’s heating and cooling systems and can reduce your utility bill. Energy Star also recommends a yearly tune-up for your HVAC equipment to keep them operating at peak efficiency and to prolong the life of your heating and cooling units. You should also have your air ducts inspected and cleaned periodically. Whichever air duct cleaning company you use, ask them about their maintenance process. Some professionals use sealants and chemical products that kill and inhibit bacteria and mould growth, which you may wish to avoid. Adding several air purifying plants to your living space won’t just improve your home air quality, they also enhance a room with character and colour. 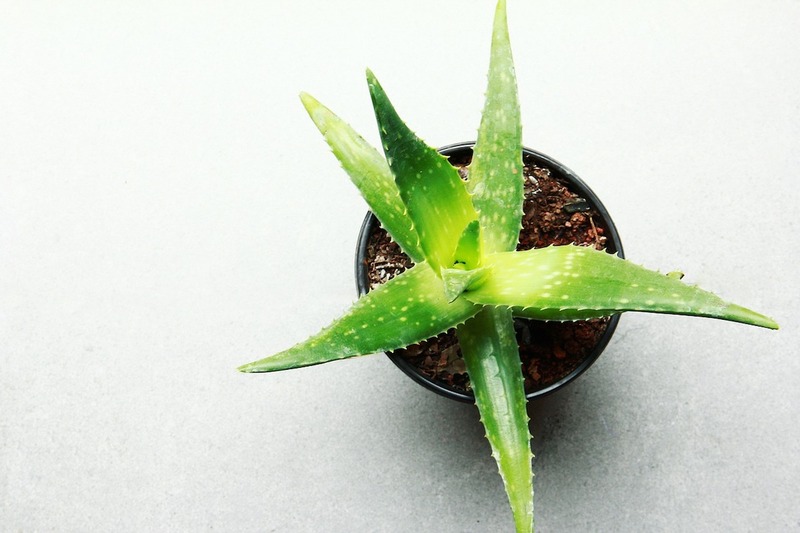 House plants convert carbon dioxide into fresh oxygen and certain plants are very efficient at eliminating or reducing household toxins like benzene and formaldehyde. Be mindful that even plants which are known for their air purifying benefits aren’t practical for every home. If one or more house occupants have sensitive allergies, some of these plants may not agree with them. Taking steps to improve the indoor air quality throughout your home is important, but it only makes sense to prioritize the quality of air in the room your family spends most of their time in – the bedroom. A Statistics Canada study of the sleep habits of 10,000 Canadians between the ages of 18-79 found that they averaged 7.12 hours of sleep every night. 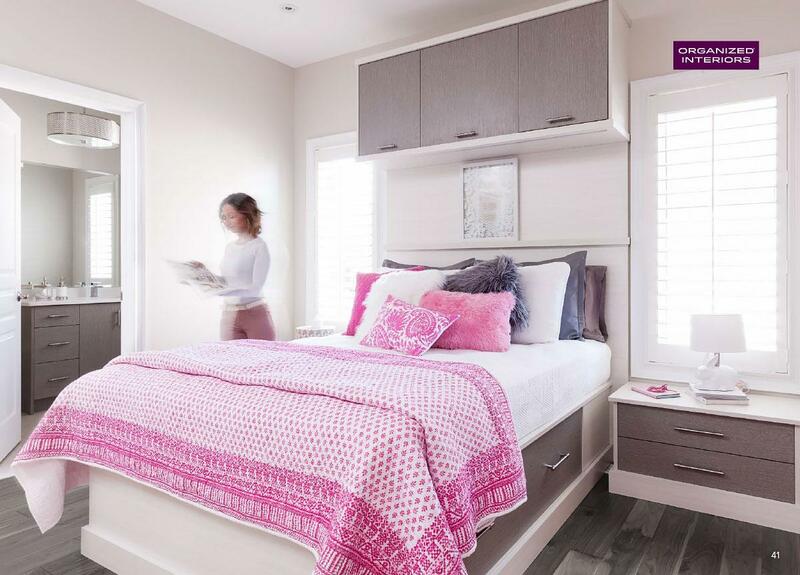 With approximately a third of our lives spent sleeping, your bedrooms should undoubtedly be one of the cleanest, most organized rooms in your house. In addition to managing your bedroom clutter, using an air purifier, and adding some plants to the bedroom, consider changing your mattress. Switiching to an eco-friendly mattress that’s chemical-free will be beneficial for your bedroom’s air quality. At the very least, vacuum your existing mattress regularly to get rid of dust mites and get anti-dust mite mattress and pillow covers. Our lifestyles make eliminating 100% of indoor pollutants at home virtually impossible. However, with simple regular maintenance, making changes to the products you buy, and investing in appliances to monitor and improve your home air quality, you’ll reduce your family’s exposure to indoor air contaminants. Consider having your home air quality tested. An expert can help you gauge what areas of your home might benefit from some measures to reduce indoor toxins. Organized Interiors can also help you to get your home organized so it’s easier to clean on a regular basis. Schedule a complimentary in-home design consultation with us today. A much-needed winter vacation is bliss while you’re relaxing in a lounge chair, enjoying some beautiful weather, and sipping a cool beverage. Unfortunately, all vacations must eventually end and then it’s back to reality. That anti-climatic return to normalcy hits some of us harder than others, especially if you’ve been away on a longer vacation or an especially enjoyable one. The feeling of sameness of the home life you temporarily left can return all too quickly. Your inner battery should be nicely recharged after some time away relaxing, but you find that you just can’t shake that feeling of post-vacation fatigue after coming home. Post-vacation fatigue is a common thing, actually. The stress and anxiety associated with it can start before you’re even home, simply by thinking about the prospect of coming home. That was the case for 45% of travellers surveyed for a Wyndham Vacation Rentals study. Post-vacation fatigue may also be characterized as post-vacation blues or, to a more serious degree, post-vacation depression. 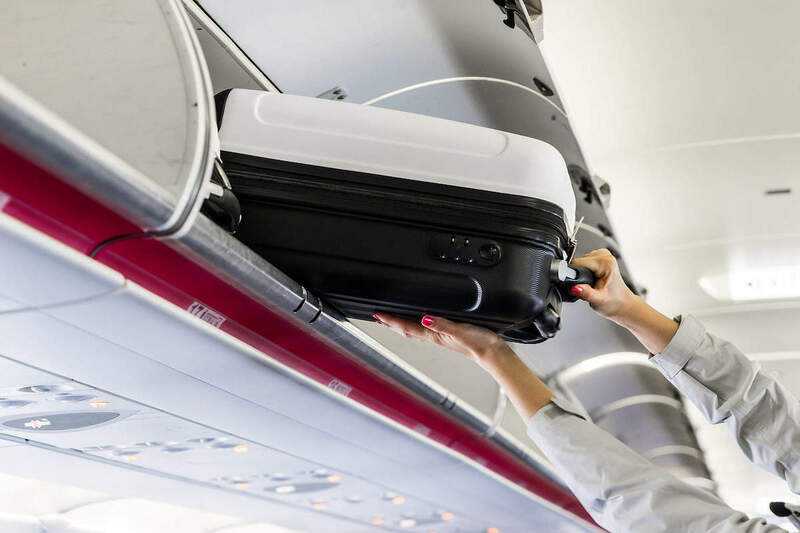 When you’re trying to get back into the swing of things after coming home from a vacation, there are a few steps you can take before and after travelling to make things easier. With these five tips, you can avoid experiencing post-vacation fatigue and learn to cope with your post-travel weariness a little better. To facilitate a smooth transition back to normalcy after being away on a trip, try to be as proactive at home before embarking on your travels. 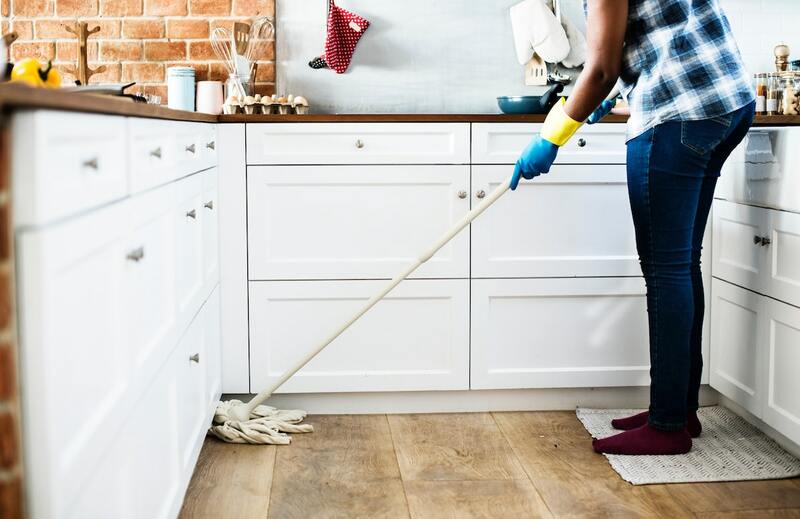 The transition of going from a temporary, carefree vacation lifestyle with far fewer responsibilities (like cooking meals) than you normally have to coming back to a dirty, cluttered home can be jarring and mentally draining. Simplify things by making sure your home is tidied up and any lingering tasks and chores are completed before going away. Accomplishing this will ensure a relatively “clean slate” when you return home and eliminate one of the main causes of post-vacation fatigue. This is easier said than done, mind you, considering how vacation getaway day is usually a whirlwind of activity. But do your best to clean, declutter, and generally make your home as welcoming a space as possible for your family to return to. Make the essential home spaces you’ll use on your first day back (like your kitchen, bathroom, bedrooms, living room, and front hallway) a priority. And don’t leave any dirty clothes in your laundry room, as you’ll be guaranteed to have laundry tasks for your family’s dirty vacation clothes. Take care of other tasks that aren’t housework-related, such as paying bills and answering all work and personal emails so you don’t need to spend any vacation time (or post-vacation time) on them. Don’t forget to activate the out-of-office auto-response function on your work email to inform colleagues and clients that you’re away. 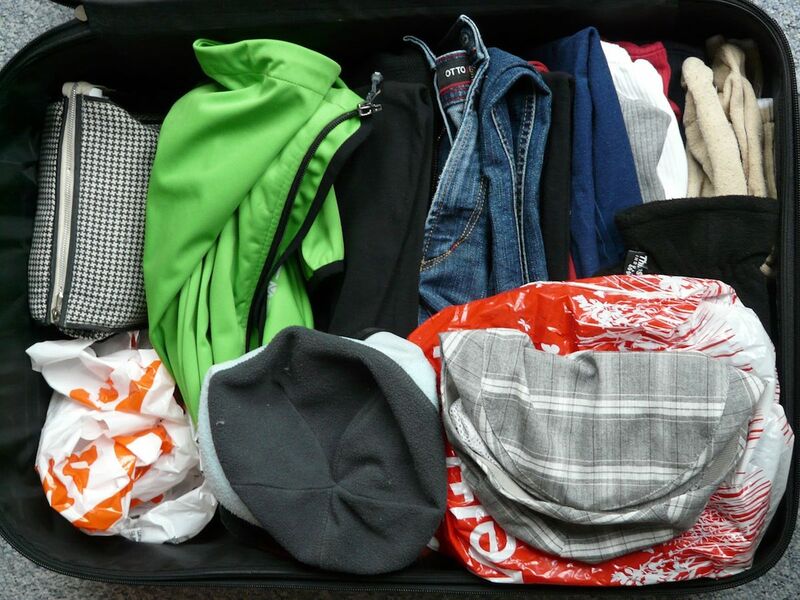 Before going on vacation, try to leave your home clean and tidy to ensure there’s less work to do upon returning. One reason people feel post-vacation fatigue is that they push themselves too hard when they’re back home. If someone’s effort to take care of as many home tasks as possible before leaving fell a little short, there can be an overwhelming feeling of “I need to catch up to get back on track”. And once again, be mindful that you’re going from a relaxed vacation headspace to a more responsibility-driven mindset. Pace yourself and ease your way back into your daily routine. Try to avoid overloading your family’s schedule with a bunch of post-vacation activities and social engagements. Some people prefer to have one or more “buffer days” when returning from a trip and going back to work. Stress about catching up on things at work is another contributor to post-vacation fatigue. Get enough sleep and try to distance yourself from that more leisurely vacation pace you’ve enjoyed the past little while, especially in your first days home. While we are recommending easing your way back into your regular routine after travelling, don’t take that too literally. But after a day or two, you should be re-acclimatized to being home and be tackling any new chores. That’s why it’s so important to take care of things at home before departing on a vacation – you’ll lighten your workload that much more. Try to unpack within a day of returning from a vacation. Only the most health-conscious of us are able to maintain healthy eating habits while we’re away on holiday. All of those rich foods, exotic cuisines, and perhaps an adult beverage or two that you enjoyed while away can add a few pounds and affect your body’s metabolism. That may be another reason you’re feeling some post-vacation fatigue. If you can muster up the energy to get your blood pumping with some physical activity, you’ll be well on your way to feeling more alive and less lethargic. Any type of workout (even a light 20-30 minute session on the treadmill) will help. Even keeping active by decluttering a particularly disorganized area of your home is healthy, not to mention practical. Excess clutter is a well-known cause of stress and you’ll feel better after restoring order to a messy space. Take a page out of the book of travellers who don’t experience post-vacation fatigue and – quite the opposite – are energized by a recent trip. There’s no better way to broaden your worldview than experiencing firsthand what a faraway destination has to offer, so start thinking ahead to a future trip. Get some inspiration by organizing your recent vacation photos and reliving some memorable moments. You don’t have to start booking flight plans just yet, although that’s not uncommon either. According to a survey by Booking.com, on the final day of their current trip, 20% of travellers actually schedule their next vacation. Having something fun like a vacation to look forward to is a healthy, motivating thing. And the anticipation of a rewarding future trip abroad can also make getting through a difficult time just a little easier to handle. Is some of your post-vacation fatigue exacerbated by clutter issues resulting from a lack of efficient home organization and storage systems? Organized Interiors can help you get your home in order and make more space for living – post-vacation and 365 days a year. Tidying expert Marie Kondo is seemingly everywhere these days. 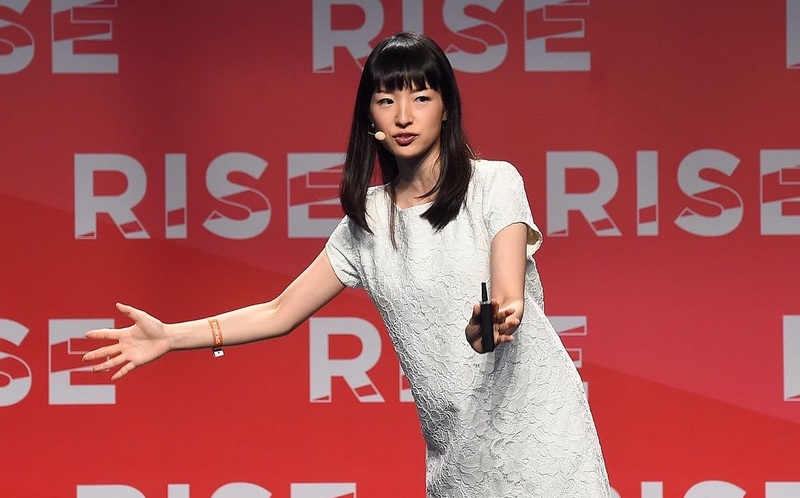 KonMari mania has been fuelled by the recent premiere of her eight-episode Netflix series, Tidying Up with Marie Kondo. While you may be aware of Kondo and some of her organizing methods, how much do you really know about the woman who was named one of Time’s “100 most influential people” in 2015 and where she came from? Keep reading to learn some interesting Marie Kondo facts. Netflix is notoriously hush-hush when it comes to revealing viewership numbers for its original programming. But based on the Kondo hype at the moment, it’s safe to assume that Tidying Up has garnered millions of new converts (or “Konverts”, as they’re known) to her organization methods. The streaming platform shrewdly timed the launch of Tidying Up (which one TV reviewer called “the happy version of Hoarders”) for New Year’s Day. And what better time of year is there to capitalize on the “must get organized!” mindset many of us are in with our New Year’s resolutions? Get to know the woman sparking joy worldwide with these nine facts about Marie Kondo. The “spark joy” element of Kondo’s organizing method (known as the KonMari Method) is well-known, but did you now that Kondo has six basic rules of tidying? Tidy by category, not by location. We here in North America may have only heard about Kondo in the last few years, but her public profile has actually been on the rise for almost a decade now. 15 years ago, Kondo started a part-time tidying business at the age of 19 while she worked full-time at a staffing agency. The tidying business took off and she soon had a six-month-long waiting list for her services. In 2010, she won first prize in a Japanese book publisher’s contest with the idea for what would become her debut book, The Life-Changing Magic of Tidying Up: The Japanese Art of Decluttering and Organizing, which was released at the end of that year. Its popularity spawned a Japanese TV movie titled The Life-Changing, Pulsing Magic of Cleaning Up and a follow-up book titled Spark Joy. Having achieved major success and fame in Japan, Australia, and Europe, Kondo turned her attention to America. 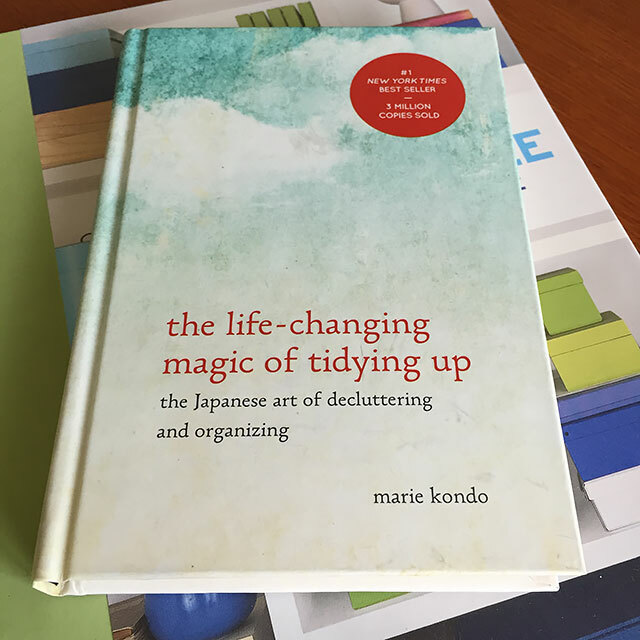 When The Life-Changing Magic of Tidying Up was released in the U.S. in 2014, it wasn’t an immediate hit. Because Kondo didn’t have much of a profile yet on this continent and her English was limited, promotional opportunities were somewhat difficult to come by. All of that changed when a New York Times reporter wrote about the book and Kondo’s organizing methods. Sales took off and as of this writing, it has spent 149 weeks on The New York Times Bestsellers list and sold over 9 million copies. Kondo made regular appearances on TV, the view counts on her instructional YouTube videos skyrocketed, and she became a pop culture darling (including shout-outs on TV shows The Mindy Project and the Gilmore Girls revival). Having enjoyed her numerous visits to Shinto shrines as a youngster, Kondo eventually worked at a shrine for a period as an attendant maiden. She connected with the Japanese religion’s teachings of treating objects with respect and how tidiness and order can create a sacred, calming space filled with pure energy. Although she doesn’t identify as particularly religious, Kondo does say that Shintoism has given her a lot of inspiration and had a big influence on her organizing methods. For example, she likes to take into consideration how a piece of clothing might like to be folded. And when discarding a piece of clothing such as a dress whose colour doesn’t spark joy for you, she thinks you should thank it for its service. Why? Because it was a helpful example of what wardrobe colour to avoid in the future. Okay, this Marie Kondo fact admittedly won’t be a complete shock to you – she’s been extremely organized her entire life. Even as a little girl, Kondo was obsessed with staying tidy and eager for any organization-related information she could get her hands on. One of her earliest organization resources were her mother’s homemaking magazines. The national library of Japan, which requires you to be at least 18 to enter, contained a wealth of organization and decluttering books and resources. You can guess where Kondo spent her 18th birthday. While studying sociology at Tokyo Woman’s Christian University the following year, Kondo wrote her thesis, “How to Declutter Your Apartment — From a Sociological Perspective”. During her schooling, friends started offering to pay her to tidy their rooms and homes, which was what lead to Kondo creating that first tidying business. Kondo’s tidying philosophy tends to get labelled as “minimalism”, which isn’t necessarily accurate. It’s more like “minimalism-adjacent”. While downsizing and less consumption are core foundations of the KonMari Method, Kondo isn’t opposed to keeping things around if they do meaningfully benefit you (aka “spark joy”). Sentimentality (and the strong emotional attachments people can make with their possessions, thereby making things harder to part with) tends to be one of the banes of professional organizers. For Kondo, however, it’s not necessarily a deal-breaker when you’re deciding what to keep and what to discard. If something with a sentimental pull truly makes you happy, Kondo sees no reason to get rid of it (she encourages it, in fact). This is all in moderation, of course. She even admits to having a soft spot for a couple of items she holds onto: a free t-shirt she got years ago at an expo and a stuffed seal Kondo’s dad gave to her. Needless to say, Kondo’s meteoric rise has lead to some naysayers and critics of her non-traditional organizing methods. They argue that her Eastern philosophies and hardline approach to decluttering (which one writer called “as ruthless as it is unrealistic”) aren’t suited to the Western world. On a shallower level, Kondo’s delivery style also rubs some people the wrong way for being overly cute, such as her signature raised index finger “spark joy pose”. If you’ve been following Kondo for awhile, you may have noticed that she always seems to be wearing something white. We mean, like, always. That’s a calculated choice as part of her brand and image, as she told The New Yorker. It makes sense. After all, what colour conveys a sense of being clean and tidy more than white? You may also wonder why Kondo almost never wears pants in any of her videos or during any of her promotional appearances. The reason is simple: several years ago, she stopped wearing them because pants no longer brought joy for her. You can’t argue that she’s not practicing what she preaches! Kondo and her tidying methods may not be for everyone. We do think it’s exciting, however, to see so much attention and awareness focussed right now on the value and importance of living with less clutter. If Marie Kondo mania has gotten you inspired to tidy up and you’re looking for more traditional organization solutions for your home, Organized Interiors can help. Schedule a free in-home design consultation with us to make plans for getting your household clutter under control. You’ve decided that it is time to tackle some organization and storage problems in your home. But when you look around, all you feel is overwhelmed and it all needs work. Relax. Just pick one room, one space in your home. Now commit to organizing that space. By focusing on just one project, you’ll feel a sense of accomplishment and that may be enough. After all, the worst thing that could happen is you get the energy and initiative to do more organizing in your home! Which space will you organize this year? There are dozens of spaces in your home that might have organization or storage problems. We have design solutions for each of them, but you have to decide where to start. You’ve been eyeing that spare room, contemplating its next incarnation, plotting the takeover, and this is the year. Transform a whole room into a walk-in closet. Imagine wall-to-wall cabinetry for clothing and accessories, a makeup area complete with vanity and even a lounging space because dressing can be so exhausting. Prepare to drool. If the last thing you look at before closing your eyes each night is a tabletop of clutter, you might want to think beyond replacing your nightstand. 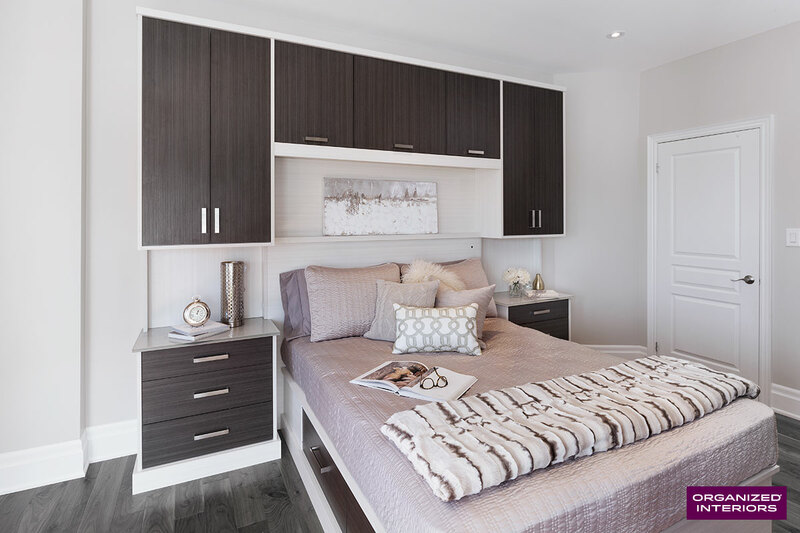 Bedroom cabinetry is custom-designed for your space and offer a stylish solution to a good night’s sleep. Do you dread doing laundry? It may feel like it’s a chore because it’s buried in a dark and dingy spot in your home, or it’s just a dreary process. It doesn’t have to be. 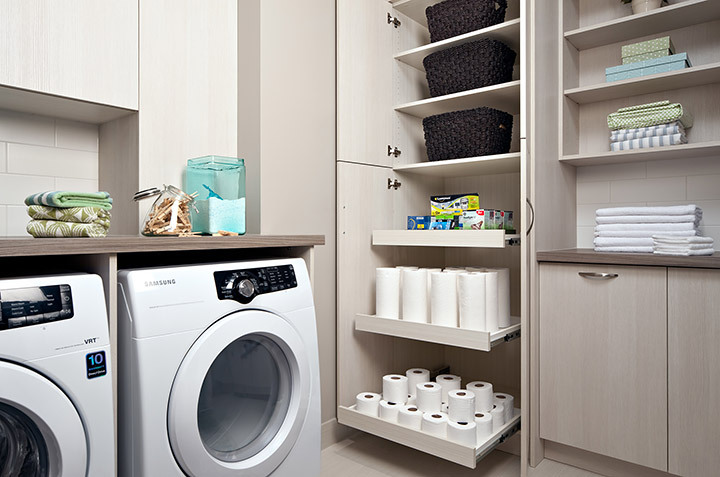 Treat your laundry room like any decorated room that can use a designer’s flare. From simple solutions to high-quality custom solutions, just look at what’s available to transform that space. The mudroom is another overlooked area of the home that can make a big contribution towards keeping your living space organized. Whether your mudroom is a small room near an entrance, is combined with your laundry room, or is a dedicated space in the hall of your home’s entryway, there are many ways to enhance its functionality. Paper isn’t going away anytime soon and home offices still need filing space to store your hard copies. 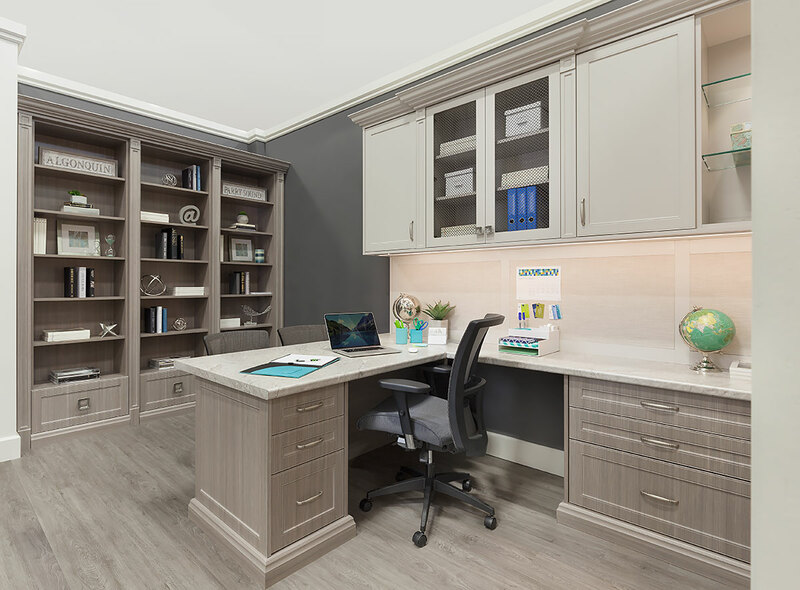 Whether it’s a corner carved out under a staircase or a full-sized room in your home, treat yourself to a home office with function and style. As our TV screens become bigger, we seem to be plugging more and more devices into them – Apple TV, Chromecast, gaming consoles, soundbars, and more. Keeping all of these devices and cables organized requires more than a sturdy shelf. Choosing a custom solution over a prefab unit has many advantages. 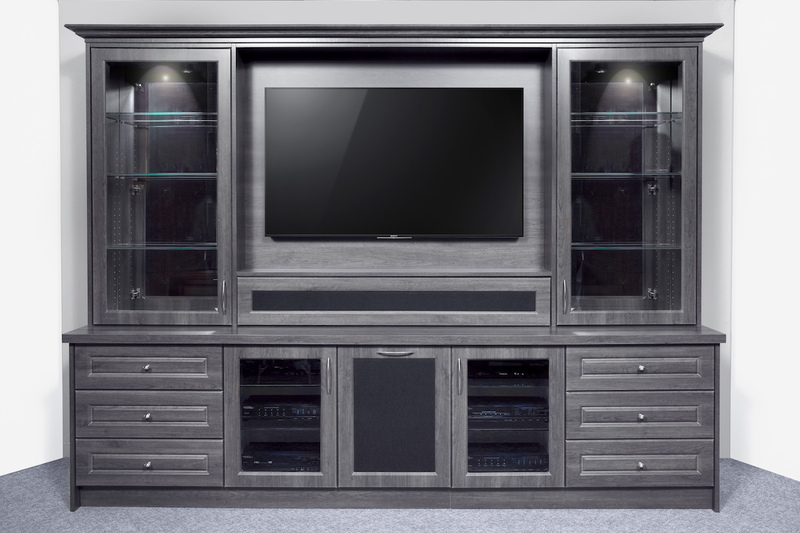 Find out why custom entertainment units are better than prefab units from big box retail stores. Do you have to slowly open your closet door just in case something is about to fall out on you? Is there a knee-deep pile of clothing on your floor? It’s time to look at some solutions to keeping your closet organized. From simple to extravagant, discover how closet organizers can maximize your storage space. The layout works, the fixtures are fine, but your bathroom cabinets are showing their age. Changing moisture levels and wear from dampness can make cabinets look dingy and worn. If it’s time for an upgrade, replace them with long-lasting, beautiful cabinets. Learn more about our custom bathroom cabinetry. If your holiday guests looked tired when they woke up, maybe it’s time to get rid of that lumpy, bulky futon. But where can you put a mattress that’s not used every day without taking up precious space? You won’t believe how a small condo added a whole guest room without adding square footage! Your kitchen is the hardest working room in your home. It also demands the most organization to function properly. You can achieve the most efficient space when you are part of planning the solution. Take a look at some of the latest innovations in our kitchen cabinetry. Collecting wine is more popular and we now see the value of devoting more space in our home to fit it into our lifestyle. Wine requires ideal conditions – a space that is dry, dark, and where things won’t be moved around. A rack wedged under a staircase just won’t do. 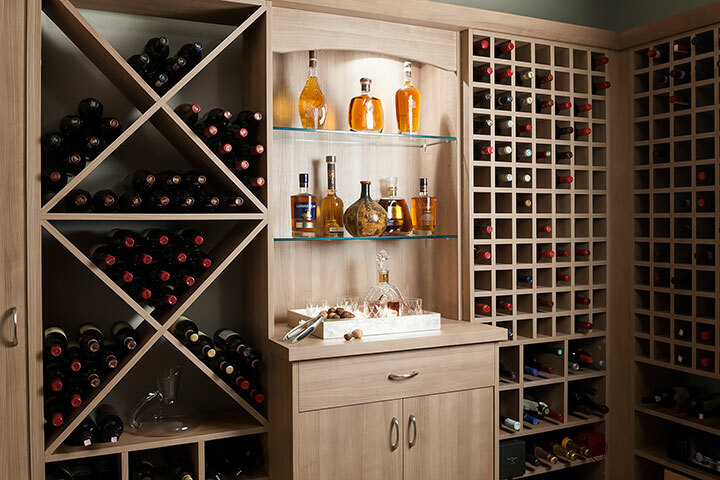 Here are some wine room ideas for keeping your collection organized. Are all your closets bulging with too much stuff? If you’re not ready to reduce clutter, redistribute it. 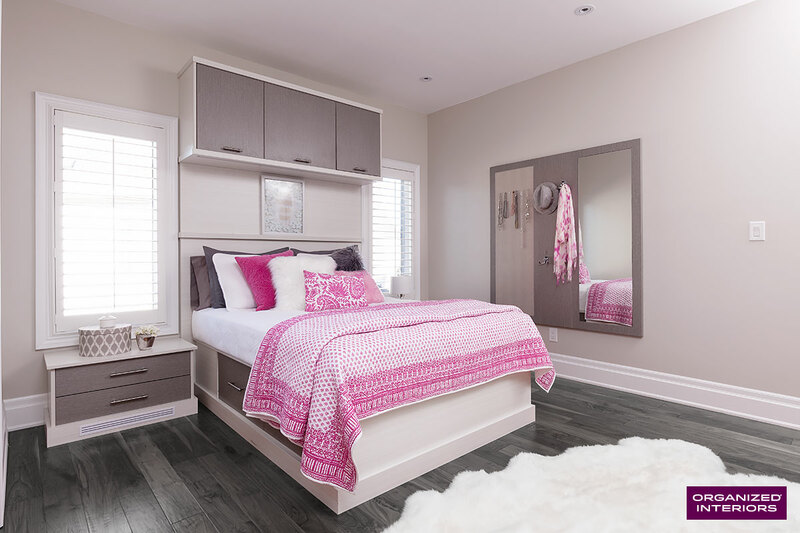 Instead of buying a pre-finished, assemble-it-yourself wardrobe unit from a big box store, take a look at a custom solution. You choose the finish, the interior layout, and the size to suit you, not the other way around. Here are some wardrobe examples. Aside from a wet bar requiring running water, you can set up a bar in almost any room in your home. All you need is a little imagination, inspiration, and customization. 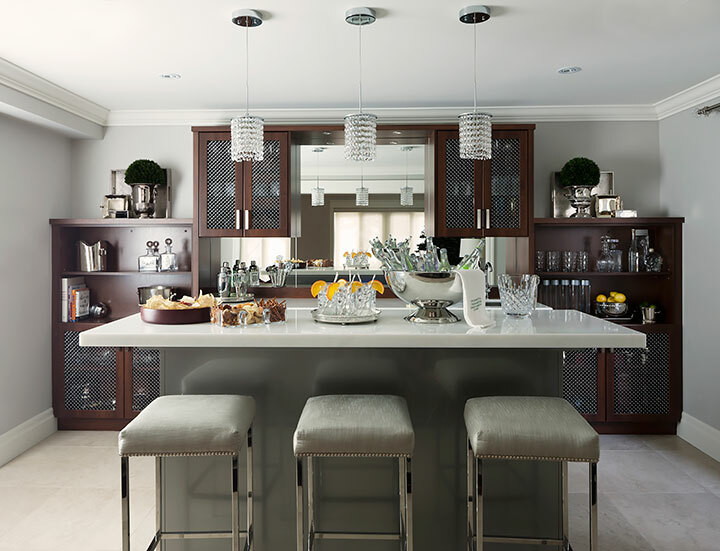 Have a look at some of these wet bar ideas from Organized Interiors. 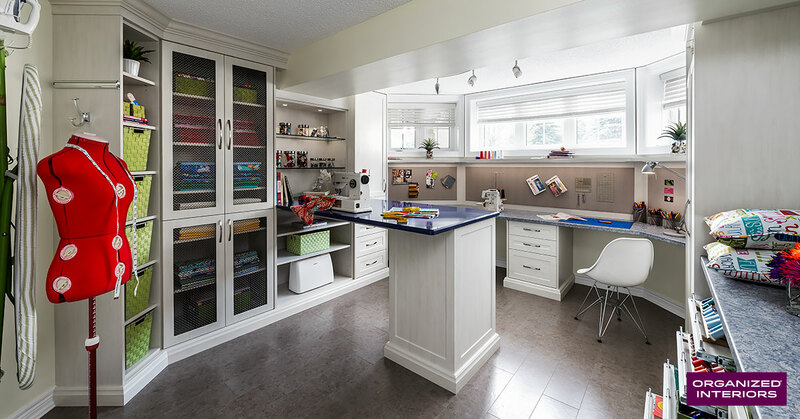 Take a spare room in your home and convert it into a multi-purpose craft room. From sewing, scrapbooking, to creating art, make a unique space that is bright, fun, and allows you to spend time doing what you love. Sometimes it’s the smallest projects that give us the greatest sense of satisfaction. 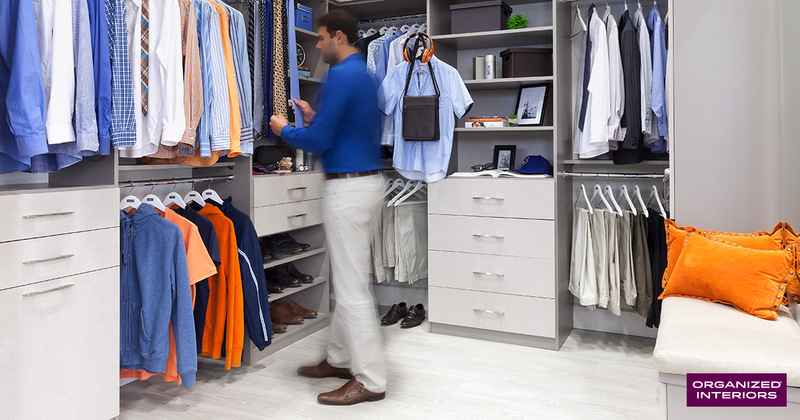 Keeping everything in your closet organized both starts and ends your day on a good note. From shoe racks to jewelry drawers, there are many options to get you organized. A valet rod is one of our most popular closet accessories. Do you see your garage as one big storage container? When it comes to attention to detail for organizing solutions, the garage is the new laundry room. This could be your one big project this year. From flooring to overhead storage, Garage Living has everything to keep your garage looking pristine and organized. Whether you decide to organize your entire home or just one space this year, Organized Interiors has a storage solution that can be customized just for you. No more excuses! Request a free design consultation to have an Organized Interiors designer come to your home and provide you with a detailed quote. It’s the holiday season and you’re probably looking for some helpful gift ideas for that hard-to-shop-for person on your gift list. Choosing something that helps the people in your life stay a little more organized makes for a gift that’s both practical and thoughtful. We’ve put together a list of some helpful gift ideas for the home that can be used for gift-giving budgets both large and small. Ranging from full room makeovers to some handy gadgets and devices, all of these gift ideas for the home will enable anyone to keep their house or condo tidier. 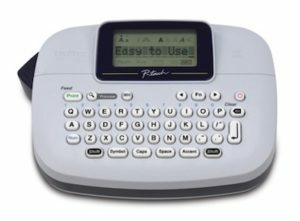 Whether it’s used in somebody’s home or office, a label maker simplifies the process of creating easy-to-read labels for just about anything. Any user will have plenty of printing sizes, fonts, symbols, and character colours to work with in order to produce labels that have a consistent, professional look. We use so many electronic devices nowadays, which means we also have lots of device chargers scattered throughout the home. Give someone you know a multi device charging station to make it easier to keep their family’s smartphones, tablets, and chargers a bit more organized. A charging station naturally won’t be used every time someone in the house needs to recharge their device. However, adding a device power station to the kitchen, front hallway, or living room provides a convenient, central spot that can cut down on clutter and time that’s wasted looking for the proper charger. Charging stations come in a few different designs. There’s the plug-in type, the dock type, and the pad type, where you just place your devices on the pad to charge them. Are you buying for someone who regularly complains about the disorderly state of their bedroom closet? You can help them reclaim the hours of lost time they waste every year dealing with a messy closet by treating them to a closet makeover. 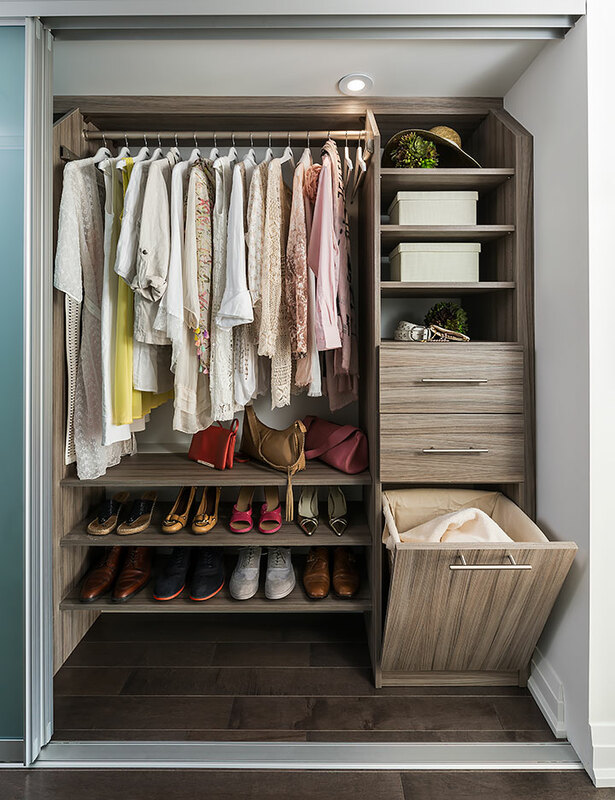 An effective closet organizer creates a place for everything and is the best solution for maximizing the storage space in a closet. With a custom closet makeover, your gift recipient’s storage needs and design tastes can all be accommodated in order to create a functional wardrobe storage space they’ll love. Any woman in your life will appreciate the usefulness of a purse organizer. These liner inserts are set within a purse and are loaded with pockets and compartments that will keep any purse well-organized. These organizers can also be conveniently removed to easily transfer the contents from one purse to another. Purse organizers are very affordable as well, ranging in price from $5 up to around $40. Make sure you choose a purse organizer that’s not made from heavy material, so as not to weigh down anyone’s purse too much. A high speed mobile scanner helps to cut down on the paper clutter that contributes to a home’s disorganization. If someone you’re buying for has been slow to adapt to modern times and still gets their bills via snail mail, give them a scanner to digitize bills, receipts, and other important documents that need to be kept. Go for a mobile, high speed scanner model to make scanning anything in the home as easy as possible. A mobile scanner can also be used to digitize a photo collection (and provide a digital backup of anyone’s valuable family pictures). Some scanner models will only scan documents and some will only scan photos, so look for a multi-purpose scanner that can handle both tasks. Giving someone the gift of a dedicated space that allows them to enjoy a hobby they love will be a special gesture that isn’t soon forgotten. Next to TV remotes and smartphones, house and car keys are a home’s most misplaced items, according to a survey done by an iPhone location app company. The survey found that at least once a week, 28% of the respondents misplaced their car or house keys. The small tracking tile is synced to a smartphone app that helps you pinpoint the location of your lost item. Tile is a reputable manufacturer of Bluetooth trackers and they carry a variety of tracker types that make great stocking stuffers. What’s more convenient than single-serving coffee pods? As pod coffee makers continue to become more commonplace in homes, more and more delicious flavours and brews become available. Sure, you could keep your kitchen counter tidy by keeping all of those pods in a decorative basket or jar, but that doesn’t always make your favourite coffee flavour the easiest to find. 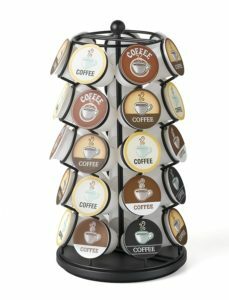 Gift someone with a coffee pod spinner, which makes it easier to find and organize coffee pods. Prices typically range from around $12 to $60. Could someone you’re buying for this holiday season use an upgrade to the room where they watch their movies and TV shows? Maybe the storage space for their TV and audio/video devices just lacks style or maybe their entertainment room looks untidy. A cluttered home entertainment space these days isn’t uncommon. After all, consider the large number of electronics we use now, such as PVRs, streaming boxes, video game consoles, surround sound systems, etcetera. That creates a setup with a lot of wires, remotes, and additional peripherals that can create a cluttered look in a room. Consider giving an entertainment unit to someone as a gift this year to create a stylish, all-in-one storage space for a room’s electronic devices and accessories. Organized Interiors can help you with some of these smart and practical gift ideas for the home. 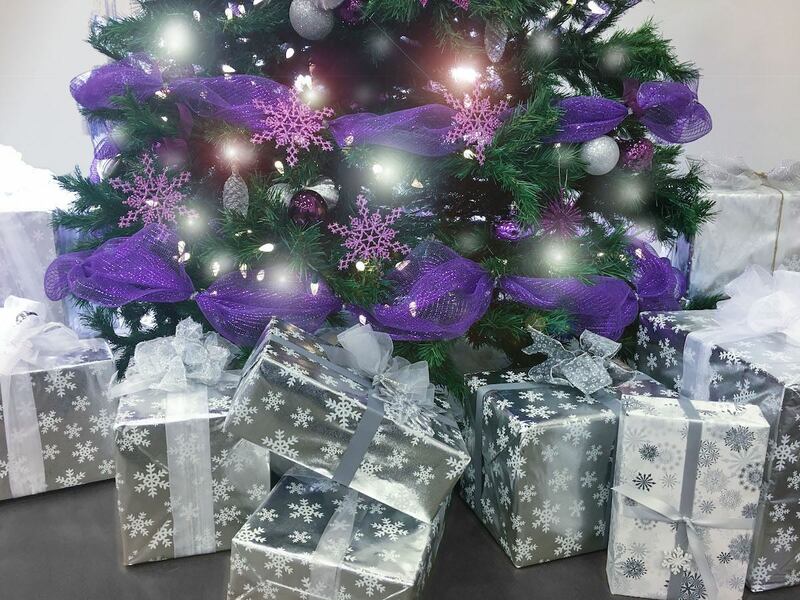 Visit our showroom in Vaughan to get a little organization inspiration this holiday season. We also provide complimentary in-home design consultations.